Pick up some salsa, it’s GameTime. If you’re looking for just another jar of salsa, you’ve come to the wrong place. Boring flavor, generic branding, and a messy jar just don’t sit well with us. Our salsa is different. So different it doesn’t even come in a jar. The flavors are unique and our single serving cups take the mess and hassle out of eating salsa. GameTime Original, Tequilla Lime Cilantro, and Smoked Jalapeno will open your taste buds to a new breed of salsa. A bold, authentic, fully dippable American Salsa. A first of its kind American Salsa. Roasted tomatoes blended with bold flavors of garlic, cayenne pepper, jalapeno, and cilantro with just enough heat to make your taste buds tingle. Bold, thick, and full-flavored. A smooth, laid-back Salsa with three complementary ingredients blended perfectly together to create the “Trifecta of Taste:” Quality tequila, a hint of cilantro, and a tangy lime chaser. Together, this “Big Three” delivers an unstoppable combination of sophisticated flavors. American Salsa with deep wood smoked flavor and enough heat to light the grill. Perfectly smoked jalapenos, onions, and chipotle peppers combine to create a salsa with a lot of spice and even more flavor. This salsa can really bring the heat. 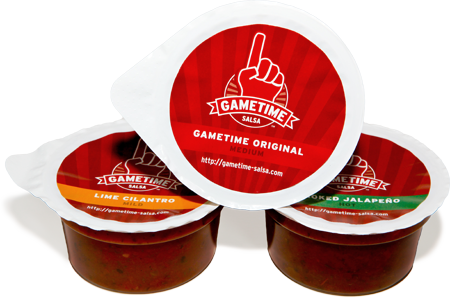 Want to distribute GameTime Salsa?